I'm redesigning ellenfinkelstein.com! What does rebranding mean for my presentation design? 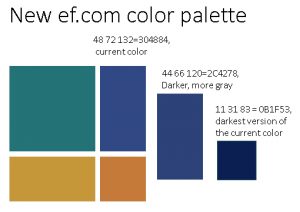 You are here: Home / Design / Backgrounds & color / I’m redesigning ellenfinkelstein.com! What does rebranding mean for my presentation design? I’m redesigning ellenfinkelstein.com! What does rebranding mean for my presentation design? Yay! I just hired a great website designer and I’m already excited. We’ve almost settled on 4 colors plus tints (we’re still discussing the dark blue shade) and we’ve chosen a WordPress theme. There will also be a new header. While this blog has been done in WordPress for years, the home page and a number of other important pages are written in HTML, which makes them harder for me to manage. It’s a big project and I’m only doing the HTML portion now, so it will take some time for this blog to look the same. Do you like the colors? While I don’t get a lot of mobile traffic on this website (less than 10% including tablets), it will be good to have these HTML pages finally responsive to the size of your screen. Look for the new website in 3-4 weeks! What does rebranding mean for my presentations? Your presentations represent you and your organization just as much as your website and should get the same design attention. That said, most people (including me) don’t spend the same type of money on designing their presentations as they do on designing their websites, although larger corporations usually do get a template professionally designed. Actually, that’s a shame because presentations are important! So of course, I’ve started creating a new theme for my presentations and I thought I’d share some of what I’m doing. An obvious first step is the set your colors. I briefly explain how to do that in the “8 steps” post that I mentioned above. PowerPoint gives you 6 accent colors so I added 2 grays — although PowerPoint automatically adds tints for each color. Here you can see the theme colors plus their tints. This first 4 are for slide backgrounds and text, so the first theme color (teal) starts in the 5th column. It’s harder to match the design style of your website and I’ve never written about this. That’s probably because my website didn’t really have any design style before! But now it will, following the WordPress theme. A current design style for websites uses bands of color and blocks of content. 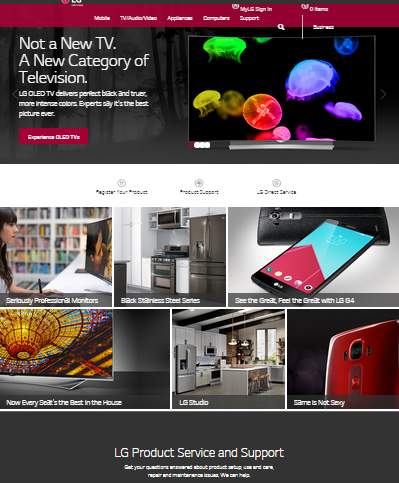 Here’s an example from LG’s website, which I’ve made smaller so you can see almost the entire page. Your presentations don’t need to match your website exactly. In fact, you probably don’t want that. But using a similar design style will help create coherence in your overall brand and message. Using your website as a guide will give you inspiration — at least that’s what happened for me. Of course, I’ll make adjustments when my website is actually finished — I’m jumping the gun a bit! But I came up with ideas that I wouldn’t have had without at least an idea of what my website was going to look like. I came up with 2 master slides and several custom layouts — this is more variety than I usually have. I could make a softer look with lighter tints or transparency or keep these rather bold colors. The point is that I have lots of options and the website colors and design concept gave me lots of ideas I never would have had otherwise. What do you think? Can your website give you inspiration for your presentations? Leave a comment! And please share with others because they might find this useful — just use the Share buttons below. Ellen, I just saw the new site. It’s great!